The weather is foul, so I keep to my chamber and paw through books to find a new tale. The cats liked Teasel Puss so well they expect much of me. That mad cat apart. He came to each telling and sayt all was sinful. And roisterous cats made all the tellings hard. When the wicked woman guises herself as a cow to deceive the bull, I sayt: What happened then, all clever cats can guess. And I know not what the black cat thinks. He watches me most close, but keeps his ears high and his coat flat. I looked to see how sat his tail, and saw he does not have one. Small wonder I cannot guess his mind. Yesterday the kitchen cat told me we were to meet this evening fair or foul. The Night-Walker had brought newes. I arrkst myself, could this Night-Walker be the spy cat Master Grey? She sayt there was no newes hot enough to keep her bones from akeing in the cold, so she would not go. She hoped I would. Many winters have passed since Grey first frighted me. I am in my prime, while he’s surely old. So I went, though the paths were wet and there was no moon nor the eyes of the Queen Cat of Heaven to light me on my way. Not many cats attended. They who did looked full-fed, with thick coats and well-fleshed bones. Night and silence. Then came a low voice, and I knew it for the voice that once struck terror in my soul. Grey (I swear ’twas he) sayt that the Stew Queen’s head had been taken from her shoulders. The Stew Queen, better known as Mary Stuart, former Queen of Scots. C.1578, by the English miniaturist Nicholas Hilliard c.1547-1619. I guessed they came from Catlick households. A young one arrkst if the Great Queen had bit her head off in a fight. I thought Grey might bite his head off for so fool a question. But Grey replied, most sweet, that the Stew Queen was no cat but a wicked woman, and her head was cut off with an axe. So may all enemies of our Great Queen perish. He sayt a cat that lodges in the house where justice was done knows a little dog that hid beneath the Stew Queen’s petticoats and accompanied her to death. This cat had listened to the dog’s lament as its coat was cleansed of her blood. Then the newes was carried hither along the great chain of cats who are our ears across this land. 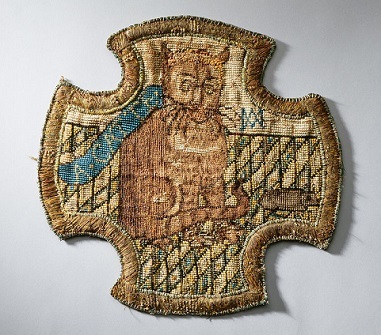 An embroidery of “a catte”, by Mary Stuart while in captivity in England. From the Royal Collection. Does the colour of the cat (red, like Mary’s hair), hint at her and her dislike of captivity? Or her patience in the waiting game? “She was brought down by conspirators!” came a call from the dark. The mad cat called his thanks to Grey. There was no reply; he had slipt away. Other cats ran off then, complaining of cold feet and paws. The black cat lingered. As did the mad cat and the young one who is his friend. We four drew together. The mad cat was joyed, saying there was such fire in his ears his whole body was warmed. The young cat (wise beyond his winters) had heared his master tell that the Great Queen was fayning [feigning] sorrow, saying she’d done no more than sign the death warrant. She’d not commanded that the thing be done. She was raging at Lord Purrlie [Burghley]. The man who carried the warrant to him had been imprisoned. And Siffrans Walsing-Em [Sir Francis Walsingham] was out of the town, having sent word of illness. Such newes, and all veracious. I hastened home with a nose so cold I could take no scents, and a head strangely full of old remembrances. The stable where I was born, my mother’s milky fur, the snorts of reeking [steaming] horses. There is but one cat in this world who calls me your Gibship. My sawcie sister. 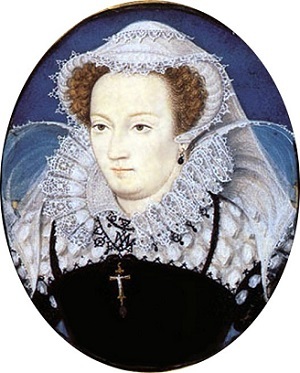 Mary Stuart was executed on 8 February 1587. She had been implicated in a plot (one of many) against Elizabeth I’s life. Both William Cecil, Lord Burghley, and Sir Francis Walsingham were keen to be rid of her because of the threat she posed to the political and religious stability of England. There’s a good account of her life on Wikipedia. Gib says that he is “in my prime”. I think he was born in early 1580, so he would now be 7. His lord, the young Earl of Southampton, turned 14 in October 1587.